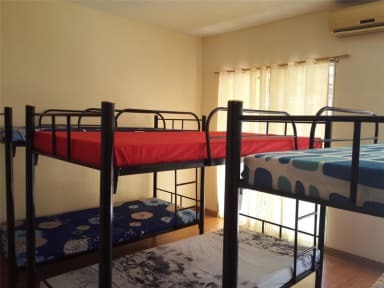 Happy to Mingle Hostel an airport area property less than 30 minutes away from NAIA Terminals 1, 2, 3 and 4. Check-in time is 2pm and check-out is 12 noon bu our reception area is open 24/7. We also offer the following for free: wifi, toiletries. Other food requests are welcomed at an additional price. For property directions, guests are encouraged to check Waze, Google Maps and Google Reviews to avoid getting lost along the way. The hostel is a family-run accommodation managed by Anna and her daughters. 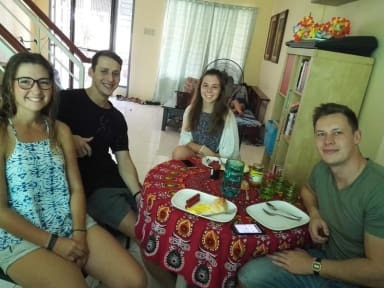 The location is not right smack in the tourist area but is in a safe and quiet neighborhood which is typical of a local community in the Philippines. Local shops and a commercial area with bars, eateries and convenience stores are a short walk away.